England may not be able to produce a decent World Cup goalkeeper, but after centuries of brewing it certainly knows its beer. 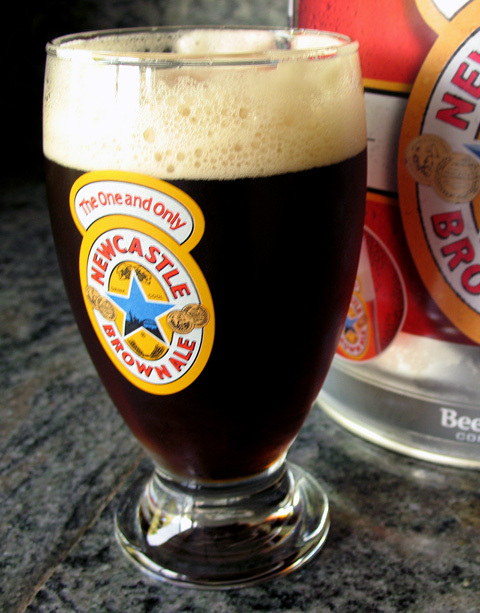 Introduced in 1927, Newcastle Brown Ale is a relative youngster compared to other English beers, debuting to acclaim and expanding since then to its current global standing. Craft beer aficionados may not clamor for Newcastle (which is imported by Heineken USA), but personally I have fond (if somewhat hazy) memories of downing pints of it during many a Westside pub session back in the day. With the USA-Ghana Round of 16 match coming up last week, I wondered what I should have on hand when The Red Bearded Hipster came over. Fortunately the booze fairy was way ahead of me and sent me a Newcastle DraughtKeg to review. Accompanying the review package was a Geordie Schooner, a custom Wellington pint glass specially branded for the American market. 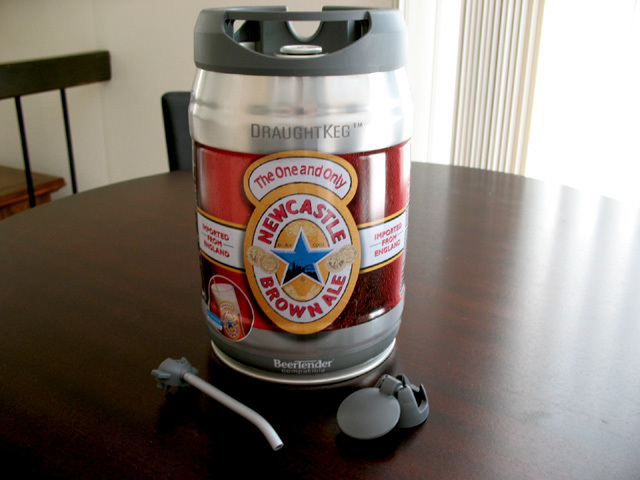 The Newcastle DraughtKeg is a steel mini-keg which holds 5 liters (1.33 gallons) of Newcastle Brown Ale. Following on the 2005 introduction of the Heineken DraughtKeg, the Newcastle version launched last August, utilizing the same internal CO2 pressurization system and mini-tap to provide a convenient, portable way to enjoy up to ten pints of beer. The DraughtKeg is compatible with the Krups BeerTender, an appliance that chills and maintains the DraughtKeg at its ideal temperature, ready for use in your Man Cave. The directions said to chill the DraughtKeg for 10 hours, so I left it in the fridge overnight. The RBH was running late, so at halftime, after deciphering the hieroglyphics of the instruction sheet, I proceeded to tap the DraughtKeg. 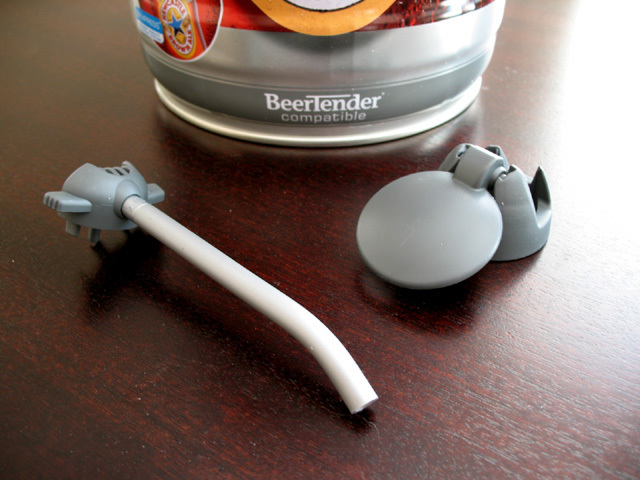 The delivery system comes in two plastic components, a tap and a nozzle. The DraughtKeg nozzle and tap. Once the beer is chilled, tapping the mini-keg couldn’t be easier. 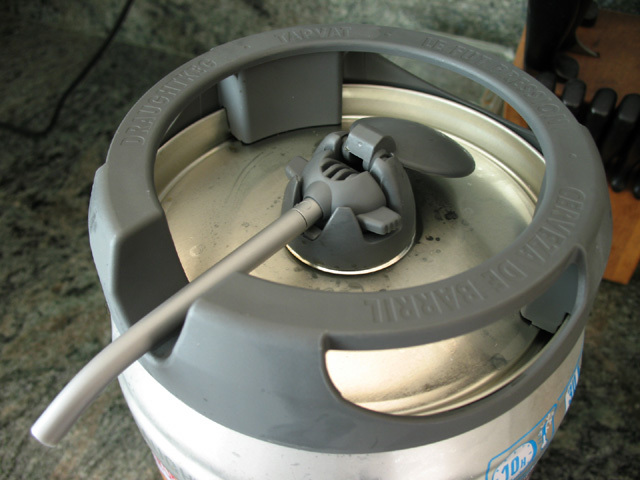 Flip the rounded handle of the tap, then snap it into place in the center of the DraughtKeg. Rinse out the nozzle in running water before sliding it into the tap. To serve the beer, position the pint glass below the nozzle and slowly flip the tap handle. Be careful not to suddenly flip the handle all the way; a full stream of beer shoots out of the nozzle, which can be messy if you’re not ready for it. After a couple of tries there was no problem with tap control. Beer flow is easy to control with the DraughtKeg tap. One thing the instructions didn’t mention (that I fortunately anticipated) was that most of the initial glass would be very foamy, just like a regular-sized keg. Also not mentioned is that some residual beer drips from the nozzle after each pour, so plan accordingly. By this time the RBH had arrived, so we filled a couple of pints and proceeded to watch Team USA go down in frustrating defeat. Ah well, at least we were able to enjoy a few rounds of fresh draught beer. Something we both noticed was that we hardly felt any effects from drinking the Newcastle. At 4.7% ABV it’s certainly average in strength, and it’s unlikely the DraughtKeg did anything to reduce the beer’s kick. Overall I found the Newcastle DraughtKeg to be an excellent product. The Newcastle pours out a rich brown with a proper head. The beer is a bit thin but smooth and very drinkable, with an upfront roasted malt and a hint of sweetness at the finish. According to the press materials, the beer will stay fresh for thirty days. A friend who bought a Heineken DraughtKeg said this wasn’t the case, but I’ve read other reviews of the Newcastle that said the beer did keep for extended periods. Not that I’d be able to keep a DraughtKeg in my fridge without killing it well before it went flat. The Newcastle held up fine over the next couple of days, though I can’t say the same for the teams I was rooting for on Sunday, from England and Mexico in the World Cup to the Dodgers against the Yankees. 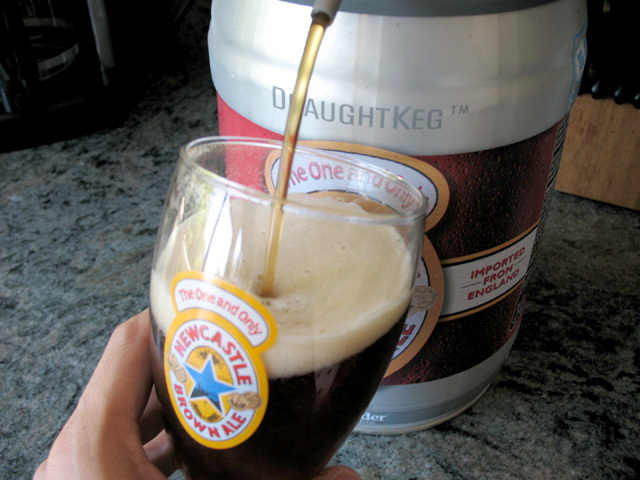 The Newcastle DraughtKeg is currently available in select U.S. markets at a suggested retail price of $22.99. For more information, visit newcastlebrown.com.